At approximately 12:03am on Thursday, December 16, 2010 Sheriff’s deputies responded to the 4500 block of Aragon Drive in Carpinteria, on a report of a person who had been stabbed. When they arrived to the area Sheriff’s deputies found a man with several stab wounds who said he had escaped from his attackers just a short time before. According to the 31-year old victim, he had voluntarily driven as a passenger with one of the suspects to a residence in Carpinteria. The suspect got out of the vehicle and entered a residence while the victim waited in the car. The suspect returned shortly with the two other suspects who also got into the car before all four men drove away together. The victim says a short time later, the suspects attacked him by punching and stabbing him multiple times. The victim was able to free himself from the suspects and jump out of the vehicle. He ran away and called 911; the suspects drove off. The victim of the stabbing, who is a 31 year old resident of Carpinteria, was taken by ambulance to the hospital where he was treated and released for non-life threatening injuries. Through their investigation, Santa Barbara Sheriff’s detectives have identified the three suspects, two of whom they arrested on Thursday. A third man remains at large. 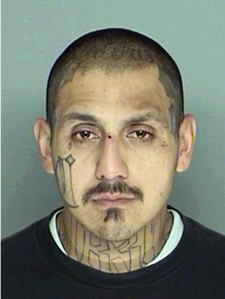 Manuel Lopez, (DOB 5/29/79) 31 year old Carpinteria resident, who is transient at this time. He has numerous tattoos including a distinctive large “C” tattooed on his right cheek and a large tattoo around his neck. If anyone sees Lopez, they are urged to call 911; do not attempt to contact him. Anyone with information related to this crime, please contact Sheriff’s Detectives at (805) 684-5405 X421 or the Sheriff’s Anonymous Tip Line at (805) 681-4171.